Hundreds of the world's best endurance horse riders will compete this weekend for the title of Australia's top endurance competitor. From midnight on Friday, they will race for 24 hours for 160 kilometres through the Barossa Ranges and Mount Crawford state forest near Adelaide. 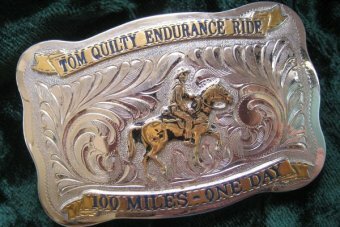 The Tom Quilty Gold Cup began when bushman RM Williams and pastoralist Tom Quilty wanted to see if current-day riders were as tough as those of past eras. Event director Jean Sims says all the competitors will find it tough this year because heavy rain in recent days has made the ground heavy. "It is a challenging course. The riders start in the darkness but they wear headlamps on their helmets and they follow luminous arrows which mark a track through the forest," she said. "It's quite wet and muddy so they'll have to slow down and just look after their horse to make sure that they get around."